ALISO VIEJO — Aliso Viejo Mayor Phillip Tsunoda is seeking re-election to the City Council on Nov. 4. Tsunoda and City Councilmember Carmen Cave are the incumbents in a five-way race for two seats on the council. The other candidates are David Harrington, who recently retired from the Orange County Sheriff’s Department; Andrew Abrecht, a photographer; and Gary V. Miller, a retired teacher. The five-member council also includes Mayor Pro Tem William “Bill” Phillips, Councilmember Ross Chun, and Councilmember Mike Munzing. Tsunoda previously served as mayor in 2010 and as mayor pro tem in 2009 and 2013. He was elected by voters in November 2010 and has served the residents of Aliso Viejo since the City Council appointed him to the post in May 2007. Tsunoda works as director of public policy and government and community relations at CalOptima, the Orange County public health plan responsible for low-income residents. Prior to that, he worked on legislative, policy and strategic planning issues for the Orange County Public Works Department. His past experience also includes serving as chief of staff to Orange County Supervisor Chris Norby. Before joining the supervisor’s staff, he served for three years as director of external affairs for Orange County Clerk-Recorder Tom Daly. From 1997 to 2004, Tsunoda was manager of government relations for the City of Anaheim and was responsible for the external governmental affairs program for Anaheim, including serving as the city’s liaison to all levels of government —local, regional, state and federal. His professional background also includes serving as a policy and legislative analyst for the Orange County Health Care Agency as well as other similar roles. He has a wealth of experience in municipal and regional public policy issues dealing with land-use, transportation, health care and law enforcement-related programs, policies and projects. Tsunoda represents the City of Aliso Viejo on the Orange County Fire Authority and Orange County Vector Control District boards. He is the city’s alternate member of the countywide Library Task Force. A resident of the city for 18 years, he was a member of the Aliso Viejo Community Association Planning Committee, where he reviewed and recommended planning and development projects, and of the Board of Trustees of the South Coast Medical Center Foundation, which raised monies to purchase medical equipment for the South Coast Medical Center. 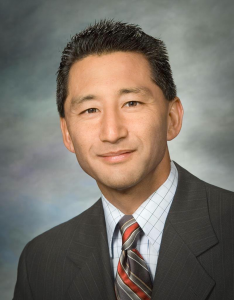 Tsunoda continues to serve on the Aliso Viejo Little League Board of Directors, which began over nine years ago. Tsunoda and his wife Laurie have been married more than 19 years and have two children, Andrew, 15, and Courtney, 11. “My family and I are proud to be … part of an extremely safe and financially strong city that embodies such an excellent quality of life,” Tsunoda said in a statement. “This quality of life is exemplified with our town’s impressive business and retail establishments, our exceptional parks and recreational amenities and facilities, our hard-working and dedicated youth organizations, and, of course, our first-rate schools. Tsunoda’s bid for re-election hit a snag when it was reported that he had used a city-maintained email list to promote his and Cave’s campaigns. Candidate Harrington said that he has filed a formal complaint with the California Fair Political Practices Commission. Tsunoda posted the following message on his Facebook page on Sept. 7: “Last week, I sent out two emails announcing the beginning of our re-election campaign. As part of that effort, I used the city’s E-News e-mail distribution list under the assumption that the email list was a public document. That was completely wrong and inappropriate and I sincerely apologize to those who were inconvenienced by receiving the emails. “After notification from the city, I had my campaign immediately stop using the City E-News email addresses and will return the email addresses to the city and purge all of the sent archived messages. In addition, I will also be financially reimbursing the city for any staff or attorney time used in addressing this issue. Please also know that the city is implementing policies and procedures that will preclude this type of situation from happening again. “Finally, I have contacted the Fair Political Practices Commission (FPPC) to request them to investigate this matter and bring forward any action they deem appropriate. I will absolutely work in cooperation with their efforts. “I would also like to apologize to Carmen Cave. She had absolutely no knowledge of this and I am very sorry for putting her in this position. The consequences of this should be mine and mine alone. “Please know that I am available to anyone in the community who would like to discuss this matter in more detail. Please feel free to contact me at (714) 981-7596. The Orange County Register quoted FPPC Communications Director Jay Wierenga as saying that an investigation can take from a month to a year and a half, and the outcome could range from a finding of no wrongdoing to a warning letter to a fine of up to $5,000. The candidates are scheduled to appear at a forum and breakfast hosted by the Aliso Viejo Chamber of Commerce on Friday, Oct. 10, from 7:30 to 9 a.m. at the Aliso Viejo Country Club, 33 Santa Barbara Dr., Aliso Viejo. For more information, call (949) 243-7402 or visit www.AlisoViejoChamber.com.